"The Revolution by the People and for the People"
Algeria (Arabic: الجزائر IPA [ɛlʤɛˈzɛːʔir], Berber (Tamazight): Lz̦ayer [ldzæjər]), is the largest country on the African continent after Sudan. It is bordered by Tunisia in the northeast, Libya in the east, Niger in the southeast, Mali and Mauritania in the southwest, and Morocco as well as a few kilometers of its annexed territory, Western Sahara, in the west. Constitutionally, it is defined as an Islamic, Arab, and Amazigh (Berber) country. The name Algeria is derived from the name of the city of Algiers (French Alger), from the Arabic word al-jazā’ir, which translates as the islands, referring to the four islands which lay off that city's coast until becoming part of the mainland in 1525; al-jazā’ir is itself short for the older name jazā’ir banī mazghannā, "the islands of (the tribe) Bani Mazghanna", used by early medieval geographers such as al-Idrisi and Yaqut al-Hamawi. 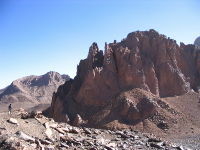 Algeria has been inhabited by Berbers (or Imazighen) since at least 10,000 BC. From 1000 BC onwards, the Carthaginians became an influence on them, establishing settlements along the coast. Berber kingdoms began to emerge, most notably Numidia, seizing the opportunity offered by the Punic Wars to become independent of Carthage only to be taken over soon after by the Roman Republic in 200 BC. As the western Roman Empire collapsed, the Berbers became independent again in much of the area, while the Vandals took over parts of the area until later expelled by the generals of the Byzantine Emperor, Justinian I. The Byzantine Empire then retained a precarious grip on the east of the country until the coming of the Arabs in the 8th century. After some decades of fierce resistance under leaders such as Kusayla and Kahina, the Berbers adopted Islam en masse, but almost immediately expelled the Umayyad caliphate from Algeria, establishing an Ibadi state under the Rustamids. Having converted the Kutama of Kabylie to its cause, the Shia Fatimids overthrew the Rustamids, and conquered Egypt. They left Algeria and Tunisia to their Zirid vassals; when the latter rebelled and adopted Sunnism, they sent in a populous Arab tribe, the Banu Hilal, to weaken them, thus incidentally initiating the Arabization of the countryside. The Almoravids and Almohads, Berber dynasties from the west founded by religious reformers, brought a period of relative peace and development; however, with the Almohads' collapse, Algeria became a battleground for their three successor states, the Algerian Zayyanids, Tunisian Hafsids, and Moroccan Marinids. In the fifteenth and sixteenth centuries, Spain started attacking and taking over many coastal cities, prompting some to seek help from the Ottoman Empire. Algeria was brought into the Ottoman Empire by Khair ad-Din and his brother Aruj, who established Algeria's modern boundaries in the north and made its coast a base for the corsairs; their privateering peaked in Algiers in the 1600s. Piracy on American vessels in the Mediterranean resulted in the First and Second Barbary War with the United States. Those piracy acts were the occasion of a slave trade, reducing people captured on the boats to slavery or attacking coastal villages in southern Europe, At the same time Europe also devoted itself it to piracy. But in the XIX century there was no corsairs. On the pretext of a slight to their consul, the French invaded Algiers in 1830, Algerians were exterminated as explained by Olivier Le Cour Grandmaison. Contrary to Morocco and Tunisia, the conquest of Algeria was long and particularly violent since it resulted in the disappearance of about a third of the Algerian population. . The French Army subjected village after village, whereas it was enough to sign some agreements to impose a protectorate on Morocco and for Tunisia but it should be specified that what characterizes the colonization of Algeria and holds place of characteristic is that it acts of a colony of settlement. In 1794, when France was attacked on all sides, that its territory was invaded on several faces and that its people and his army were likely to be famished, the dey of Algiers Hussein offered to Convention all facilitated to make its purchases of corn since it did not find what nowhere to nourish its soldiers. Under the directory, since the war does not continue any less and that the treasure is empty, the dey of Algiers authorizes a loan of a million without interêts to France. The finished war, France does not honour its debt, any the modes which follow one another do not pay in Algeria the sums due and the dey is thus in cold with the French Consul, understanding that it will recover neither the payment of the deliveries having however been so profitable for the fight of the borrower against the European powers which had been united against the Revolution nor the lent money. In 1827, the dey of Algiers still discovers a fact much more serious, at the end is Regency in Calle, France had the concession of a commercial warehouse. The French government, by the voice of its Deval representative, had promised to the dey that the warehouse would not be strengthened - it was a site to make trade, but anything more - but France had strengthened it. Not obtaining explanations on behalf of the in writing solicited French government, April 30, 1827 the dey asked some the French Consul verbally. Being unaware of his requests openly, not condescending to answer, the consul took the thing top, then furious of such a contempt, the dey carried, insulted, and finally gave to the "representative of France" a blow of his drive out-fly. The government of the restoration and Charles X, anxious to regild the image of France abroad and to reinforce the royal authority in France, then found in this incident a pretext to intervene militarily. However, intense resistance from such muslim personalities as Emir Abdelkader, Ahmed Bey and Fatma N'Soumer made for a slow conquest of Algeria, not technically completed until the early 1900s when the last Tuareg were conquered. Meanwhile, however, the French made Algeria an integral part of France, a status that would end only with the collapse of the Fourth Republic. Tens of thousands of settlers from France, Italy, Spain, and Malta moved in to farm the Algerian coastal plain and occupy the most prized parts of Algeria's cities, benefiting from the French government's confiscation of communally held land, and the application of modern agriculture techniques that increased the amount of arable land. People of European descent in Algeria settlers (or natives like Spanish people in Oran), as well as the native Algerian Jews (typically Sephardic in origin), became full French citizens starting from the end of the 19th century (the so-called Pieds-Noirs after the independence); by contrast, the vast majority of Muslim Algerians (even veterans of the French army) received neither French citizenship nor the right to vote. Algeria's social fabric was stretched to breaking point during this period: literacy plummeted , while land confiscation uprooted much of the population. However, the population increased steadily . Before the putsch of December 2, 1851 in France, even though the extension of colonisation was made difficult due to the maintain of intagibillity of individual property and banning transactions over tribe's territory, 131 000 Europeans including 66 000 French were installed in Algeria. This name replaces the old name "Possessions françaises dans le Nord de l'Afrique" not because of an official act, like a decree or an ordonance. Indeed, a letter from General SCHNEIDER, Ministre of War, dated from October 14, 1839 to Marechal VALEE General Governor states that the name Algérie (Algeria) shorter and most sgnificant, must be used in all acts and certificates issued by military and civil authorities. In 1954, the National Liberation Front (FLN) launched the guerrilla Algerian War of Independence; after nearly a decade of urban and rural warfare, they succeeded in pushing France out in 1962. Most of the 1,025,000 Pieds-Noirs, as well as 91,000 Harkis (pro-French Muslim Algerians serving in the French Army), together forming about 10% of the population of Algeria in 1962, fled Algeria for France in just a few months in the middle of that year. Algeria's first president, the FLN leader Ahmed Ben Bella, was overthrown by his former ally and defense minister, Houari Boumédiènne in 1965. Under Ben Bella the government had already become increasingly socialist and dictatorial, and this trend continued throughout Boumedienne's government; however, Boumedienne relied much more heavily on the army, and reduced the sole legal party to a merely symbolic role. Agriculture was collectivised, and a massive industrialization drive launched. Oil extraction facilities were nationalized and this increased the state's wealth, especially after the 1973 oil crisis, but the Algerian economy became increasingly dependent on oil, bringing hardship when the price collapsed in the 1980s. In foreign policy Algeria was a member and leader of the 'non-aligned' nations. A dispute with Morocco over the Western Sahara nearly led to war. Dissent was rarely tolerated, and the state's control over the media and the outlawing of political parties other than the FLN was cemented in the repressive constitution of 1976. Boumédienne died in 1978, but the rule of his successor, Chadli Bendjedid, was little more open. The state took on a strongly bureaucratic character and corruption was widespread. The modernization drive brought considerable demographic changes to Algeria. Village traditions underwent significant change as urbanization increased, new industries emerged, agriculture was substantially reduced, and education, a rarity in colonial times, was extended nationwide, raising the literacy rate from less than 10% to over 60%. Improvements in healthcare led to a dramatic increase in the birthrate (7-8 children per mother) which had two consequences: a very youthful population, and a housing crisis. The new generation struggled to relate to the cultural obsession with the war years and two conflicting protest movements developed: left-wingers, including Berber identity movements, and Islamic 'intégristes'. Both protested against one-party rule but also clashed with each other in universities and on the streets during the 1980s. Mass protests from both camps in autumn 1988 forced Benjedid to concede the end of one-party rule, and elections were announced for 1991. In December 1991, the Islamic Salvation Front won the first round of the country's first multiparty elections. The military then canceled the second round, forced then-president Bendjedid to resign, and banned the Islamic Salvation Front. The ensuing conflict engulfed Algeria in the violent Algerian Civil War. More than 160,000 people were killed (17-Jan-1992 to June 2002), often in unprovoked massacres of civilians. The question of who was responsible for these massacres remains controversial among academic observers; many were claimed by the Armed Islamic Group. After 1998, the war waned, and by 2002 the main guerrilla groups had either been destroyed or surrendered, taking advantage of an amnesty program, though sporadic fighting continued in some areas. Elections resumed in 1995, and on 27 April 1999, after a series of short-term leaders representing the military, Abdelaziz Bouteflika, the current president, was elected. The issue of Berber language and identity increased in significance, particularly after the extensive Kabyle protests of 2001 and the near-total boycott of local elections in Kabylie; the government responded with concessions including naming of Tamazight (Berber) as a national language and teaching it in schools. Much of Algeria is now recovering, developing into an emerging economy. The high prices of oil & gas are being used by the new government to improve the county's infrastructure and especially improve industry and agricultural land. Recent overseas investment in Algeria has increased. The head of state is the President of the Republic, who is elected to a 5-year term, renewable once. Algeria has universal suffrage. The President is the head of the Council of Ministers and of the High Security Council. He appoints the Prime Minister who is also the head of government. The Prime Minister appoints the Council of Ministers. Throughout the 1960s, Algeria supported many independence movements in sub-Saharan Africa, and was a leader in the Non-Aligned Movement. While it shares much of its history and cultural heritage with neighbouring Morocco, the two countries have had somewhat hostile relations with each other ever since Algeria's independence. This is due to two reasons: Morocco's disputed claim to portions of western Algeria (which led to the Sand war in 1963), and Algeria's support for the Polisario, an armed group of Sahrawi refugees seeking independence for the Moroccan-ruled Western Sahara, which it hosts within its borders in the city of Tindouf. Tensions between Algeria and Morocco, as well as issues relating to the Algerian Civil War, have put great obstacles in the way of tightening the Maghreb Arab Union, nominally established in 1989 but with little practical weight, with its coastal neighbors.. Under the 1976 Constitution (as modified 1979, and amended in 1988, 1989, and 1996) Algeria is a multi-party state. All parties must be approved by the Ministry of the Interior. To date, Algeria has had more than 40 legal political parties. According to the Constitution, no political association may be formed if it is "based on differences in religion, language, race gender or region." It is the direct successor of the Armé de Libération Nationale (ALN), which fought French colonial occupation during the Algerian War of Independence (1954-62). The People's National Army consits of 127,500 members, with some 100,000 reservists. The army is under the control of the president, who also is minister of National Defense (current president is Abdelaziz Bouteflika). Defense expenditures accounted for some $2.67 billion or 3.5% of GDP. One and a half years of national military service is compulsory for males. Algeria is a leading military power in North Africa and has its force oriented toward its western (Morocco) and eastern (Libya) borders. Its primary military supplier has been the former Soviet Union, which has sold various types of sophisticated equipment under military trade agreements, and the People's Republic of China. Algeria has attempted, in recent years, to diversify its sources of military material. Military forces are supplemented by a 45,000-member gendarmerie or rural police force under the control of the president and 30,000-member Sûreté nationale or Metropolitan police force under the Ministry of the Interior. Recently, the Algerian Air Force signed a deal with Russia to purchase 49 MiG-29SMT and 6 MiG-29UBT at an estimated $1.5 Billion. They also agreed to return old airplanes purchased from the Former USSR. Algeria is currently divided into 48 wilayas ( provinces), 553 dairas ( counties) and 1541 baladiyahs ( municipalities). The capital and the largest city of Algerian wilayas, dairas, and baladiyahs has always the same name as the wilaya, the daira, or the baladiyah it is located in, the same counts for the largest daira of the wilaya or the largest baladiyah of the daira. 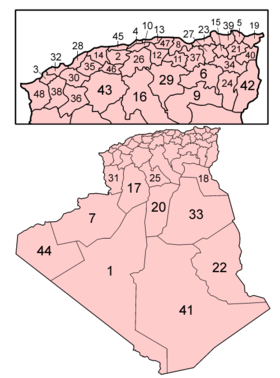 According to the Algerian constitution, a wilaya is a "territorial collectivity" enjoying some economic freedom, the APW, or "L'Assemblée Populaire Wilayale" (the Popular "Wilayale" Parliament) is the political entity governing a province, directed by the " Wali" ( Prefect), who is chosen by the Algerian President to handle the APW's decisions, the APW has also a "president", who is elected by the members of the APW. In the Tell, temperatures in summer average between 21 and 24 °C and in winter drop to 10 to 12 °C. Winters are not cold, but the humidity is high and houses are seldom adequately heated. In eastern Algeria, the average temperatures are somewhat lower, and on the steppes of the High Plateaus winter temperatures hover only a few degrees above freezing. A prominent feature of the climate in this region is the sirocco, a dusty, choking south wind blowing off the desert, sometimes at gale force. This wind also occasionally reaches into the coastal Tell. Rainfall is fairly abundant along the coastal part of the Tell, ranging from 400 to 670 mm annually, the amount of precipitation increasing from west to east. Precipitation is heaviest in the northern part of eastern Algeria, where it reaches as much as 1000 mm in some years. Farther inland the rainfall is less plentiful. Prevailing winds that are easterly and northeasterly in summer change to westerly and northerly in winter and carry with them a general increase in precipitation from September to December, a decrease in the late winter and spring months, and a near absence of rainfall during the summer months. 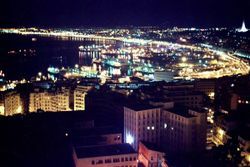 Algiers is the capital and economic hub of Algeria. The fossil fuels energy sector is the backbone of Algeria's economy, accounting for roughly 60% of budget revenues, 30% of GDP, and over 95% of export earnings. The country ranks 14th in Petroleum reserves, containing 11.8 billion barrels of proven oil reserves with estimates suggesting that the actual amount is even more. The Energy Information Administration reported that in 2005, Algeria had 160 trillion cubic feet (Tcf) of proven natural gas reserves, the 8th largest in the world. Algeria’s financial and economic indicators improved during the mid-1990s, in part because of policy reforms supported by the International Monetary Fund (IMF) and debt rescheduling from the Paris Club. Algeria’s finances in 2000 and 2001 benefited from an increase in oil prices and the government’s tight fiscal policy, leading to a large increase in the trade surplus, record highs in foreign exchange reserves, and reduction in foreign debt. The government's continued efforts to diversify the economy by attracting foreign and domestic investment outside the energy sector has had little success in reducing high unemployment and improving living standards. In 2001, the government signed an Association Treaty with the European Union that will eventually lower tariffs and increase trade. In March 2006, Russia agreed to erase $4.74 billion of Algeria's Soviet-era debt during a visit by President Vladimir Putin to the country, the first by a Russian leader in half a century. In return, president Abdelaziz Bouteflika agreed to buy $7.5 billion worth of combat planes, air-defence systems and other arms from Russia, according to the head of Russia's state arms exporter Rosoboronexport. 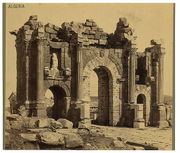 Since Roman times Algeria has been noted for the fertility of its soil. About a quarter of the inhabitants are engaged in agricultural pursuits. More than 7,500,000 acres (30,000 km²) are devoted to the cultivation of cereal grains. The Tell is the grain-growing land. During the time of French rule its productivity was increased substantially by the sinking of artesian wells in districts which only required water to make them fertile. Of the crops raised, wheat, barley and oats are the principal cereals. A great variety of vegetables and of fruits, especially citrus products, is exported. A considerable amount of cotton was grown at the time of the United States' Civil War, but the industry declined afterwards. In the early years of the 20th century efforts to extend the cultivation of the plant were renewed. A small amount of cotton is also grown in the southern oases. Large quantities of crin vegetal (vegetable horse-hair) an excellent fibre, are made from the leaves of the dwarf palm. The olive (both for its fruit and Petroleum) and tobacco are cultivated with great success. 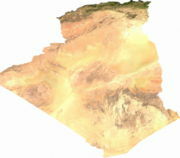 Algeria also exports figs, dates, esparto grass, and cork. It is the largest oat market in Africa. Demographics of Algeria, Data of FAO, year 2005 ; Number of inhabitants in thousands. 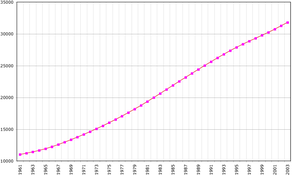 The current population of Algeria is 32,930,091 (July 2006 est.). About 70% of Algerians live in the northern, coastal area; the minority who inhabit the Sahara desert are mainly concentrated in oases, although some 1.5 million remain nomadic or partly nomadic. Almost 30% of Algerians are under 15. Ninety-nine percent of the population is classified ethnically as Arab/ Berber and religiously as Sunni Muslim, the few non-Sunni Muslims are mainly Ibadis from the M'Zab valley. (See also Islam in Algeria.) A mostly foreign Roman Catholic community of about 45,000 exists, as do very small Protestant and Jewish communities. The Jewish community of Algeria, which once constituted 2% of the total population, has substancially decreased due to emigration mostly to France and Israel. Europeans account for less than 1% of the population. During the colonial period there was a large European (primarily French) pied-noir population, concentrated on the coast and forming a majority in certain cities. Almost all of this population left during or immediately after independence from France. Most Algerians are Arab or Berber, by language or identity, and of mixed Berber-Arab ancestry, the origin Berber being in a majority. The Berbers inhabited Algeria before the arrival of Arab tribes during the expansion of Islam, in the 7th century. The issue of ethnicity and language is sensitive after many years of government marginalization of Berber (or Imazighen, as some prefer) culture. Today, the Arab-Berber issue is often a case of self-identification or identification through language and culture, rather than a racial or ethnic distinction. The 20% or so of the population who self-identify as Berbers, and primarily speak Berber languages (also termed Tamazight), are divided into several ethnic groups, notably Kabyle (the largest) in the mountainous north-central area, Chaoui in the eastern Atlas Mountains, Mozabites in the M'zab valley, and Tuareg in the far south. Education in Algeria has been explained as pretty good compared to the other developing countries. Schooling in Algeria is compulsory and is attended by most children in Algeria. This lasts for 9 years. You start off at 6 years old and go through until you are 15 years old. 97% of boys attend school while 91% of girls attend school in Algeria. Algeria only has 10 universities across the whole country and a number of technical colleges. All of this tallies up to 350,000 students going to college or university. Algeria's official language, Arabic, is spoken natively in dialectal form (" Darja") by some 80% of the population, and, as in the entire Arab world, used in the Modern Standard Arabic variant in the media and on official occasions. Some 20% of the population, identified as Berbers or Imazighen, are native speakers not of Arabic, but of some dialect of Tamazight. Many Algerians are however fluent in both languages to some degree. Arabic remains Algeria's only official language, although Tamazight has recently been recognized as a national language alongside it. The Ethnologue counts 18 living languages within Algeria, splitting both Arabic and Tamazight into several different languages, as well as mentioning the unrelated Korandje language. The language issue is politically sensitive, particularly for the Berber minority, which has been disadvantaged by state-sanctioned Arabization. Language politics and Arabization have partly been a reaction to the fact that 130 years of French colonization had left both the state bureaucracy and much of the educated upper class completely Francophone, as well as being motivated by the Arab nationalism promoted by successive Algerian governments. French is still the most widely studied foreign language, and widely spoken (distantly followed by English), but very rare as a native language. Since independence, the government has pursued a policy of linguistic Arabization of education and bureaucracy, with some success, although many university courses continue to be taught in French. [[Image:Amazigh_berber_language.PNG|thumb|350px| Bereber in North Africa [[Image:Algiers mosque.jpg|thumb|Mosque in Algiers.]] Modern Algerian literature, split between Arabic and French, has been strongly influenced by the country's recent history. Famous novelists of the 20th century include Mohammed Dib, Albert Camus, and Kateb Yacine, while Assia Djebar is widely translated. Important novelists of the 1980s included Rachid Mimouni, later vice-president of Amnesty International, and Tahar Djaout, murdered by an Islamist group in 1993 for his secularist views. As early as Roman times, Apuleius, born in Mdaourouch, was native to what would become Algeria. In philosophy and the humanities, Malek Bennabi and Frantz Fanon are noted for their thoughts on decolonization, while Augustine of Hippo was born in Tagaste (about 60 miles from the present day city of Annaba), and Ibn Khaldun, though born in Tunis, wrote the Muqaddima while staying in Algeria. Algerian culture has been strongly influenced by Islam, the main religion. The works of the Sanusi family in pre-colonial times, and of Emir Abdelkader and Sheikh Ben Badis in colonial times, are widely noted. The Algerian musical genre best known abroad is raï, a pop-flavored, opinionated take on folk music, featuring international stars such as Khaled and Cheb Mami. However, in Algeria itself the older, highly verbal chaabi style remains more popular, with such stars as El Hadj El Anka or Dahmane El Harrachi, while the tuneful melodies of Kabyle music, exemplified by Idir, Ait Menguellet, or Lounès Matoub, have a wide audience. For more classical tastes, Andalusi music, brought from Al-Andalus by Morisco refugees, is preserved in many older coastal towns. In painting, Mohammed Khadda and M'Hamed Issiakhem are notable in recent years.